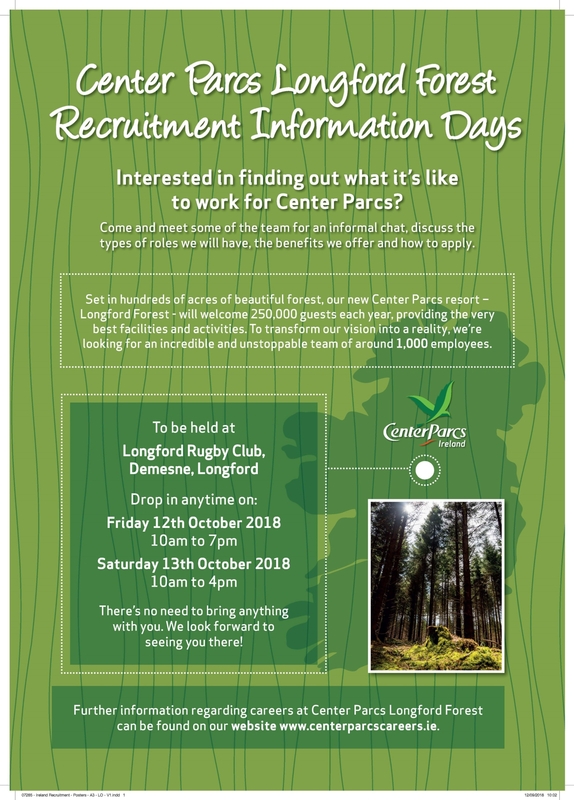 Center Parcs Longford Forest will host two recruitment information days, beginning on Friday, October 12 from 9.45am – 7pm to kick off the recruitment process for the 1,000 permanent roles that are being created by the opening of Ireland’s first €233m Center Parcs forest holiday resort. Center Parcs Longford Forest is currently under construction with an expected opening date in summer 2019. Minister for Business, Enterprise, and Innovation, Heather Humphreys, TD will join senior management and staff from Center Parcs UK to welcome potential candidates and provide information on the much anticipated 1,000 permanent roles across areas like leisure, retail, catering and hospitality, and to bring to life what it’s like to work at Center Parcs. The recruitment information days take place at Longford Rugby Club from 10am to 7pm on Friday, October 12 and on Saturday, October 13 from 10am to 4pm.